This week, MSSNY joined 32 other state medical societies—along with a number of national specialty societies—in signing a letter that was sent to the ABMS and its boards outlining the problems associated with Maintenance of Certification (MOC). The group has requested a meeting with ABMS for December. There is a long-standing absence of transparent communication from the certifying boards. The letter we have signed onto—and the proposed meeting—are steps towards making the boards aware of the significant problems physicians are having with MOC. We want to work with the leaders of the certifying boards to ensure physician self-regulation. Among the many things I oppose regarding MOC are the high stakes exams that cost physicians thousands of dollars to comply and take time away from work. There is a lack of relevance to the process—they test knowledge but there is no evidence that they test competence. The theoretical purpose of these exams is to assure competence and evidence of lifelong learning, when in fact they accomplish neither goal. In fact, the MOC exams simply do not relate to the way physicians practice medicine. Another issue is the ability of the board to withdraw certification. Clinical practice is always evolving, based on the health needs of the population, technical advances and physician interests. 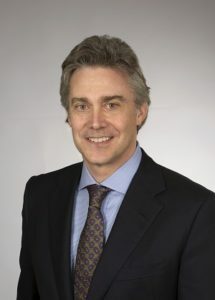 A board should not be able to retract a certification that a physician has earned; for example, a physician who is board certified in pediatrics and goes on to earn a board certification in ophthalmology should not have his or her pediatrics certification clawed back (this happened to OB-GYNs that treated men). If you earn a B.S. in psychology from Harvard and end up becoming a journalist, does that void the B.S. in psychology? The certifying boards have a history of overreaching. They need to return to the business of providing certification that physicians have completed their training with a certain level of competence. The MOC process needs to be restructured. There simply has to be a better way. This week, Monroe County Medical Society President Dr. Peter Ronchetti’s letter entitled “Neither Patients nor Physicians Benefit from Medical Liability Bill” ran in the Rochester Business Journal. “This bill would do nothing to improve the ability of New Yorkers to access high-quality health care or improve outcomes,” writes Dr. Ronchetti. “In fact, if passed, at the very least it will drive physicians out of New York and create a barrier to new physicians choosing to practice here.” Click here to read Dr. Ronchetti’s letter in full. All physicians are urged to continue to call Governor Cuomo at 518-474-8390 and send a letter here urging that he veto a so-called “cancer only” medical liability statute of limitations expansion bill (S.6800/A.8516) that passed the Legislature over the strong objections of MSSNY, the specialty societies, the hospital industry and MLMIC. Please urge that legislation be enacted that provides for comprehensive medical liability reform. This ambiguously drafted bill, introduced in the final days and passed in the final hours of the 2017 Legislative Session, would expand the medical liability statute of limitations for cases involving “alleged negligent failure to diagnose a malignant tumor or cancer”. The bill would permit lawsuits 2.5 years from the “date of discovery” of such alleged negligence, up to an outside limit of 7 years. Actuaries have estimated that this legislation could increase already exorbitant premiums by 10-15% at a time when no increases can be tolerated. Again, please urge the Governor to veto this bill and encourage your colleagues to do the same! Please let the Governor know how this bill will harm patient care and exacerbate existing physician shortage issues in your community. President Donald Trump on Thursday declared the country’s opioid epidemic “a national emergency,” just days after HHS Secretary Tom Price said the opioid misuse epidemic could be “addressed without the declaration of an emergency.” President Trump said he’s drafting the necessary paperwork to put the declaration into effect. Please see this guidance from the New York State Department of Health announcing that, effective July 1, there must be a documented face-to-face (F2F) encounter by a physician or other care provider with certain Medicaid insured patients for the initial authorization for home health services provided by a Certified Home Health Agency (CHHA). The requirement is the result of a provision contained in the Affordable Care Act. As set forth in the guidance, the F2F documentation requirements for Medicaid patients in need of home health care only apply to Medicaid fee-for-service (FFS) coverage serviced by CHHAs. The CHHA must maintain a copy of the F2F documentation in the clinical record. F2F rules are not applied to managed care cases, or to cases that are personal care service-only. Moreover, DOH confirmed that the following are also exempt from Medicaid F2F documentation requirements: Fully Integrated Duals Advantage (FIDA); Medicaid Advantage; Special Needs Plans (SNPs); the Program for All-Inclusive Care for the Elderly (PACE); and Health and Recovery Plans (HARP). MSSNY worked together with the Home Care Association of New York State (HCA) to draft guidelines well before the July 1 effective date for DOH to use as the basis for implementation of the Medicaid F2F rules required by the ACA. The purpose was to ensure a streamlined process for physicians and home care agencies, and the narrowest applicability of the requirements to avoid the kinds of extensive, onerous, duplicative and confusing standards set by the U.S. Centers for Medicare and Medicaid Services (CMS) in the case of F2F for Medicare home health services. Your membership yields results and will continue to do so. When your 2018 invoice arrives, please renew. KEEP MSSNY STRONG! New York Medicaid Director Jason Helgerson recently announced the progress that New York’s Medicaid Delivery System Reform Incentive Program (DSRIP) has made, noting that New York had closed its second year with a 14.9% reduction in Potentially Preventable Readmissions and an 11.8% reduction in Potentially Preventable ER Visits. The report also noted that, if the current Reduction rates are maintained, New York will achieve its goal of a 25% reduction in avoidable hospital use by DSRIP Year 5. The report also noted that New York’s Performing Provider Systems (PPS) have earned a total of $2.4 billion, which is 95% of all available funds. While these are important achievements for New York’s DSRIP program, MSSNY continues to raise concerns to state officials that funds allocated to many of these PPS across the State are not ultimately being distributed to the downstream PPS participating providers to support their efforts in helping to bring about these important reductions. Enroll for your complimentary Brooks Brothers Corporate Membership Card and Save 15%* on full priced merchandise at all Brooks Brothers U.S. and Canadian stores, by phone and online. At the top of the page click on My Account & then CREATE AN ACCOUNT. Create new profile and at the bottom click on “I have a Corporate Membership Number”. Enter 12 digit Membership Number. Click on create and you will receive a Welcome Letter. You are now ready to shop! 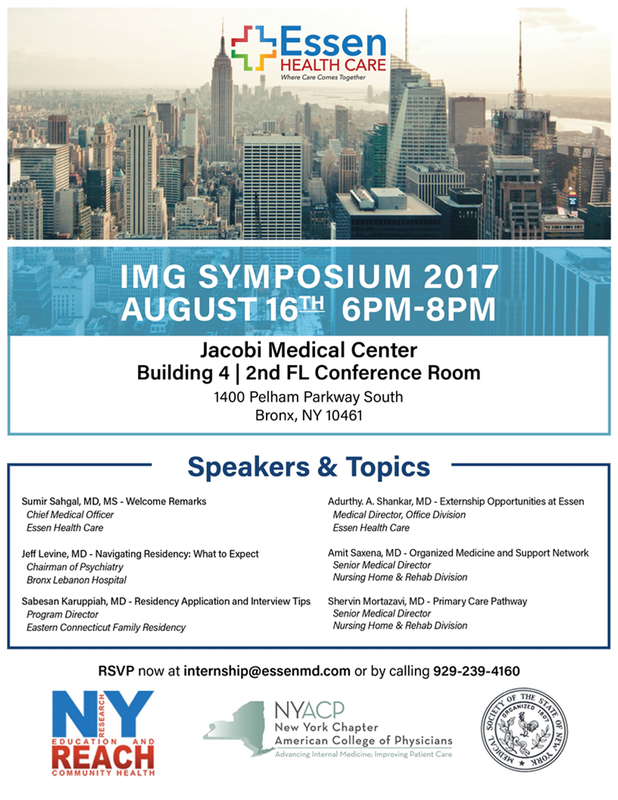 Essen Health Care will host an IMG Symposium on August 16th from 6-8 pm at Jacobi Medical Center in the Bronx. Topics range from Navigating Residency: What to Expect to Residency Application and Interview Tips; and from Organized Medicine and Support Network to Primary Care Pathway. IMGs are invited to participate in a pre-symposium networking from 5:30 PM to 6:00 PM. If you are driving please park in Parking Lot #4. The lot will be open from 5:30 PM to 8:00 PM. Click here for more information on the symposium. Check out MSSNY’s New CME Website and Listen to our Many Podcasts! Did you know that we recently updated and completely revamped the MSSNY CME website? Check it out here (Note: new users to the site will need to create an account). You can earn free CME credits on emergency preparedness topics that range from our four-part Physician’s Electronic Emergency Preparedness Toolkit to Ebola, a Perspective from the Field or Mosquito Borne Diseases. We also have a module on concussion in pediatric and adult patients as well as a CME accredited podcast on the same topic. MSSNY also has more than ten informative podcasts that you can listen to here. There are multiple brief podcasts on immunizations as well as others on Zika virus and MSSNY’s Physician’s Emergency Preparedness Toolkit. Each podcast offers insight from medical experts on topics they are extensively well versed on. AAAA-certified (by end of summer). on Long Island.Close to expressways. 3 exam rooms, 1 procedure room /OR. Waiting room, break room and personal office. Free WIFI. Available for full or half-days. ObGyn/Podiatry or other Medical MDs. Want to Sell Your Medical Practice? Do You Have Medical Office Space to Sell or Share?